About 350,000 Jewish children are currently enrolled in Jewish day schools, in every continent other than Antarctica. This is the first book-length consideration of life in such schools and of their relationship both to the Jewish community and to society as a whole. It provides a rich sense of how community is constructed within Jewish schools, and of how they contribute to or complicate the construction of community in the wider society. The volume reframes day-school research in three ways. First, it focuses not just on the learner in the day-school classroom but sees schools as agents of and for the community. Second, it brings a truly international perspective to the study of day schools, viewing them in relation to the socio-cultural contexts from which they emerge and where they have impact. Third, it considers day-school education in relation to insights derived from the study and practice of non-parochial education. This cross-cultural and genuinely comparative approach to the study of Jewish schooling draws on research from the United States, the former Soviet Union, South America, and Europe, making it possible to arrive at important and original insights into parochial Jewish schooling. With contributions from outstanding scholars as well as practitioners of public education and of Jewish parochial schooling, the volume reveals conflicting conceptions of the social functions of schooling and also produces original insights into the capacity of schools to build community. The book is timely in that it studies questions about faith-based schooling and the public good that today are as much questions of public policy as they are of academic inquiry. It will appeal first and foremost to those with a particular interest in Jewish schooling but will also attract the attention of academics and professionals concerned with the place of parochial education in contemporary society. 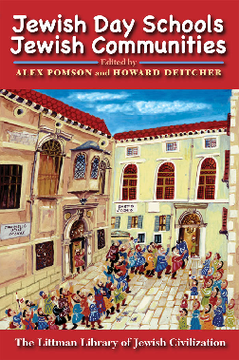 CONTRIBUTORS Ami Bouganim, Erik H. Cohen, Ira Dashefsky, Howard Deitcher, Jay Dewey, Joshua Elkin, Yoel Finkelman, Zvi Gitelman, Scott J. Goldberg, Ellen B. Goldring, Yossi J. Goldstein, Eli Kohn, Jeffrey S.Kress, Binyamin Krohn, Jon A. Levisohn, Ilana Maryles Sztokman, Deborah Meier, Helena Miller, Christine Muller, Michal Muszkat Barkan, Alex Pomson, Joseph Reimer, Randal Schnoor, Susan L. Shevitz, Asher Shkedi, Claire Smrekar, Uriel Ta'ir, Michael Turetsky, Rahel Wasserfall. Alex Pomson is a senior lecturer at the Melton Centre for Jewish Education at the Hebrew University. He trained in History at the University of Cambridge, and received his PhD in Religious Education from the University of London in 1994. He was founding Head of Jewish Studies at the King Solomon High School. From 1996 to 2004, he served as Associate Professor of Jewish Teacher Education at York University, Toronto where he coordinated York’s Jewish Teacher Education Programme. He is past chair of the Network for Research in Jewish Education. He completed a longitudinal study funded by the Social Sciences and Humanities Research Council of the Canadian Government, to be published in 2008, as a book Back to School: Jewish Day School as a Source of Meaning in the Lives of Adult Jews. His work has been published in numerous academic journals, including Teachers College Record, Educational Research, Reflective Practice, the Canadian Journal of Education, and Journal of Curriculum Studies. Howard Deitcher is the director of the Melton Centre for Jewish Education and a senior lecturer at the School of Education at the Hebrew University of Jerusalem. He completed his rabbinic ordination at the Chief Rabbinate of Canada and his doctorate in education from Yeshiva University in New York. In 1990-91 he was awarded a post-doctoral fellowhip at the Philosophy of Education Research Centre at Harvard University. He is past director of the Jerusalem Fellows Program as well as director of Intensive Development Programs at the Mandel Leadership Institute. He was the founding principal of the Efrata Experimental School in Jerusalem, and has served as a consultant for Jewish schools around the world. He has edited two books Educational Issues and Classical Jewish Texts (1990), which was awarded the National Jewish Book Award, as well as Understanding the Bible in Our Times (2003). 1 Building Community Within and Around Schools: Can Jewish Days Schools Measure Up? 6 Do Jewish Schools Make a Difference in the Former Soviet Union?